Alestorm in Montreal or Quebec City? Inform me about the next events for Alestorm. Enroll yourself to our priority waiting list for Alestorm to be alerted when new tickets are available. Filling this form doesn't engage you to any purchase. 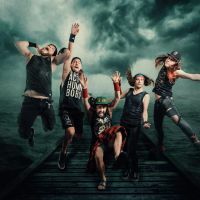 Alestorm is planning a concert in our region and you are looking for quality tickets? Look no further, you are in the right place. 514-Tickets is a broker specializing in tickets for concerts, shows and sporting events. Over the years we have succeeded in creating a more diverse inventory for such venues as the Bell Centre, St-Denis Theatre and Étoile Banque Nationale to name a few. With every purchase our company offers its 100% Satisfaction Guarantee and each purchase is sent to you by priority mail which is quick, easy and safe. If you have any questions or need more information, do not hesitate to contact us at 514-245-5387. A member of our team will be happy to assist you.